Theater provides a plethora of benefits to those who study it, including increased confidence, resilience, collaboration, discipline, and creativity. Deerfield Academy is proud of its award-winning, active theater program. In a typical year, more than 100 students participate as actors and technicians and more than 2,500 patrons attend four annual productions. Recent productions include Little Shop of Horrors, Metamorphoses, Blood Wedding, and Leading Ladies. Since 2002 Deerfield has been selected four times to represent the United States in the American High School Theatre Festival at the world-renowned Edinburgh International Fringe Festival in Scotland. 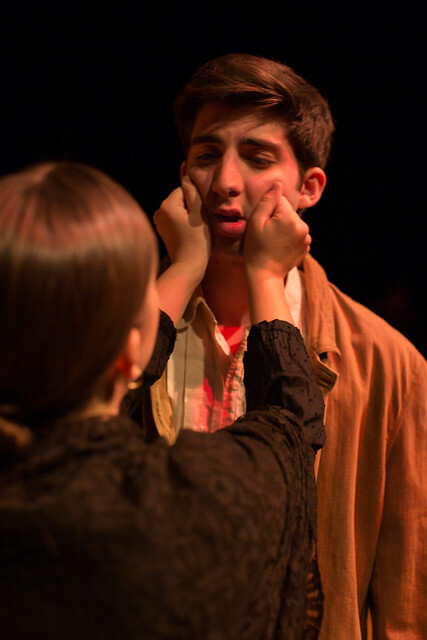 In 2014, the Deerfield Academy production of Looking After Norman won the Best Production Award at this prestigious arts festival, and this trip allowed students to be immersed in theatrical culture in one of the most prominent theater hubs in the world. This trip is a regular occurrence every three years for Deerfield’s dedicated theater students. Our magnificent state-of-the-art facilities in the newly renovated Hess Center for the Arts allow unlimited creative and artistic outlets. The Hess Center includes three performance spaces – the Hess Auditorium, the Black Box Studio, and the Acting Lab – and gives students access to such spaces as the script library, the costume storage and construction rooms, and the props room. There are plenty of ways to get involved in theater at Deerfield. Numerous classes are offered throughout the year, ranging in levels from Acting I to Acting and Directing for Production, a tutorial-level class. We also offer more focused courses and workshops on Shakespeare, writing, directing, auditioning, and improvisation at various points throughout the year. Theater is also available as a cocurricular option. No experience is necessary for any production–the only requirement is a desire to work hard and have some fun. Students may audition for a role or sign up for the tech crew, where they will learn about lighting, set construction, sound design, costumes, props, and stage management. Additionally, students are encouraged to write or direct their own work, such as in the new Festival of Student Writing, launched in Spring 2016. Should you require more information, please do not hesitate to contact the Theater Program Director, Catriona Hynds. Find out why warming up is an essential step to any stage performance. Throughout the year, a number of guest artists lead workshops and master classes. Recent guests include Lasse Hallström, Matthew Fox, Andrew Ritter and Lena Olin. Additionally, our extensive facilities allow for visits from touring production companies, most recently the acclaimed Aquila Theater Company production of William Shakespeare’s The Tempest.